This sweet chicken asado recipe is inspired by the usual pork asado and the chicken adobo with potatoes. But unlike those dishes, this one does not contain soy sauce. So the brownish color of this dish is made thru frying the meat and potatoes and the brown sugar. 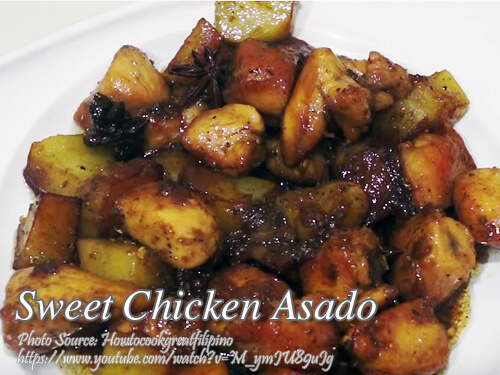 This variation of chicken asado is good for those who does not like soy sauce on their dishes. Put salt and pepper on the chicken breast and mix. In a medium size wok, heat oil and fry the chicken until slightly brown. Then add the garlic and potatoes. Fry for 7 minutes and stir constantly to avoid burning. Then reduce the amount of cooking oil for at least 1 tablespoon. Add 1 cup of water, star anise, five spice powder and brown sugar. Cook for 5 to 7 minutes until the sauce is slightly thick. Serve hot.